Over the past couple of years, I have learnt so much about makeup and I still have a whole lot more to learn but discovering tricks of the trade always makes me happy, especially on those rare days that I look in the mirror and think 'my makeup actually looks pretty good today' those are the days I realise just how far I have come with my makeup application skills. Now primers are not a necessity within your makeup bag, but they definitely help with the overall appearance of your makeup, helping to create that flawless look you see on models in magazines. A face primer such as this one by Laura Mercier helps to moisturise the skin, stopping your foundation from sticking to any dry patches. It also mattifies the skin, reducing any oily areas such as the t-zone, stopping your foundation from sliding back off and helping to keep your makeup in place all day long. 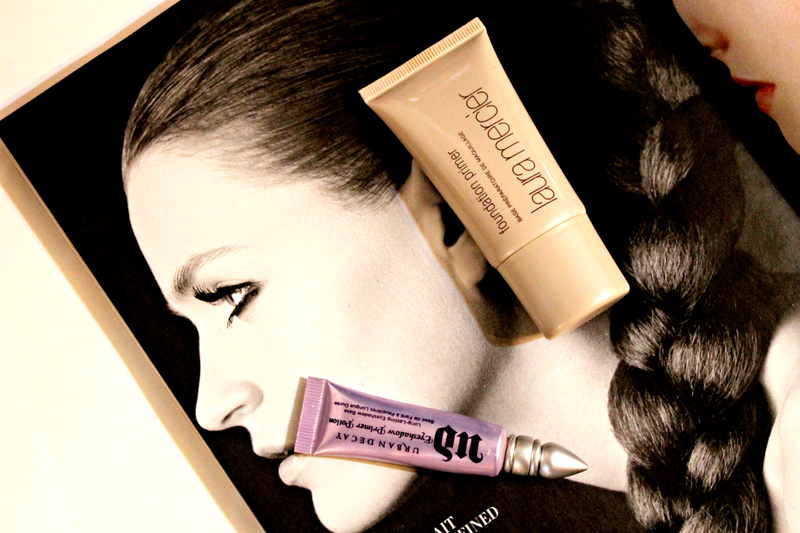 After applying a primer all over your face, it would probably seem pretty useless to use another on your eyes right? I thought so too, until I used the famous Urban Decay Eyeshadow Primer Potion! A friend of mine swears by this primer, she told me to give it a go and I haven't looked back since. This eyeshadow primer helps to bring out the pigment in any eyeshadow that I use, it stops my eyeshadows from creasing and makes them last all day and night. But the thing I love this for the most? having hooded eyelids means that my eyeliner always ends up transferring near my eyebrows, slightly embarrassing when I don't notice until the end of the day, but this primer seems to stop that happening as it keeps my eyeliner in place too! These two primers are the best I have tried and I don't think i'll be changing them anytime soon, I don't wear them on a daily basis but I wouldn't go out on a night out without them! Do you use a primer? Which one's are your favourite?